Big gatherings are typical in Nepal where it is said “the Nepalese people observe more festivals than there are days in a year. There are different festivals celebrated to honor Hindu and Buddhist gods and goddesses and others to recreate important events from ancient mythology and epic literature.” Bini is looking forward to the Dashian, a religious festival that lasts for 15 days at the end of October. For this festival, her family would cook a goat and buffalo and make curry with chicken and “whatever else was possible.” Usually 100 to 250 people would come to that event. 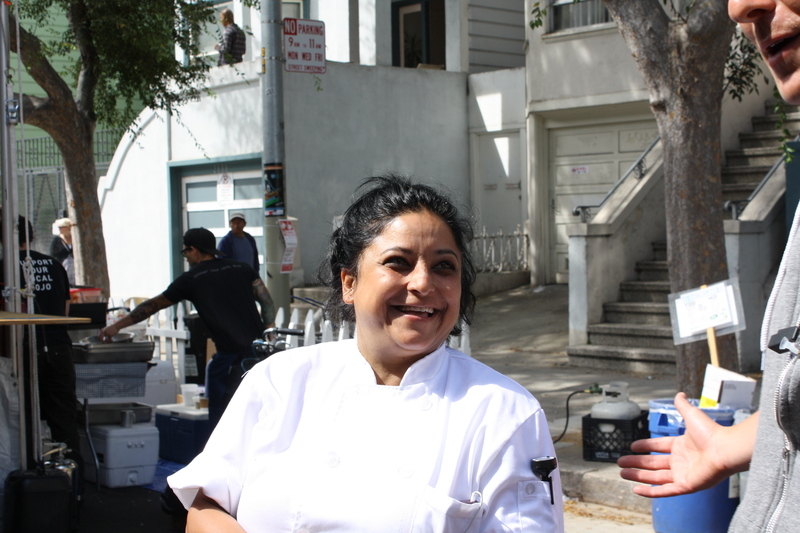 Bini went to culinary school in Mumbai before moving to San Francisco and joining La Cocina’s business incubation program nearly a year ago. 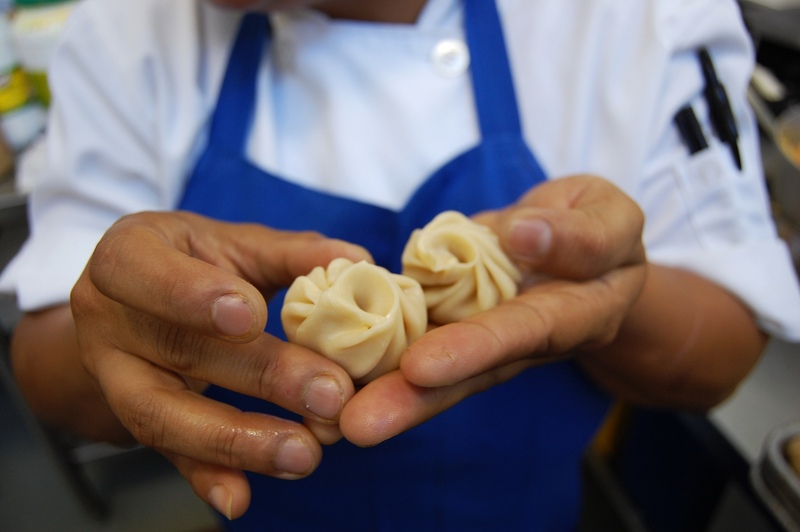 Her menu includes sumptous curries, dahls, rotis and other Nepalese specialties including her beloved momos. 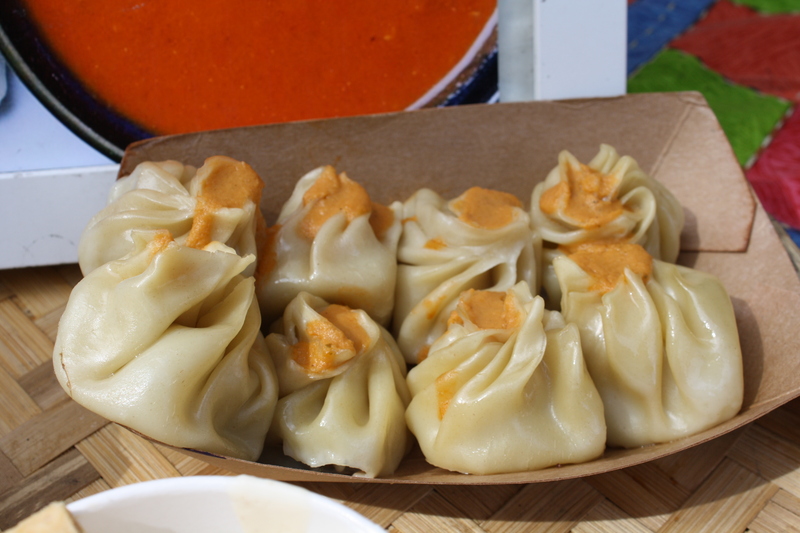 Also found in Tibet, Bhutan, Sikkim, and other parts of India, a momo is a type of steamed or fried dumpling that boast numerous variations of filling. 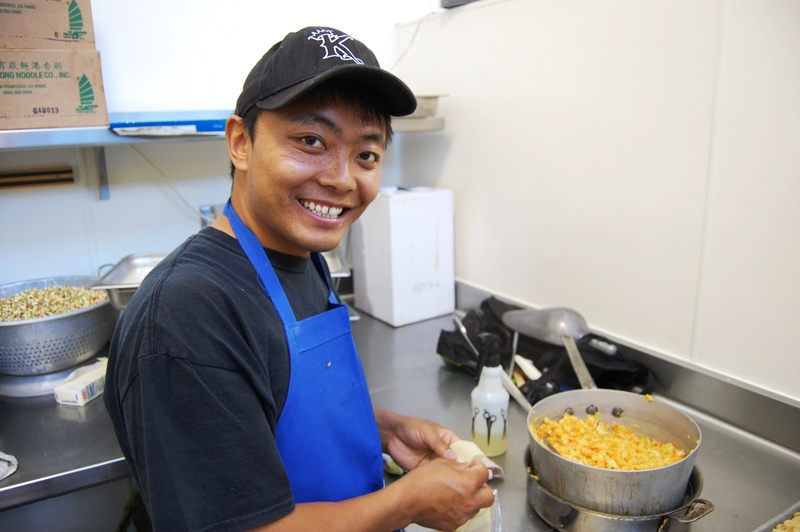 Bini’s specialties include turkey, lamb, and cabbage (vegetarian). 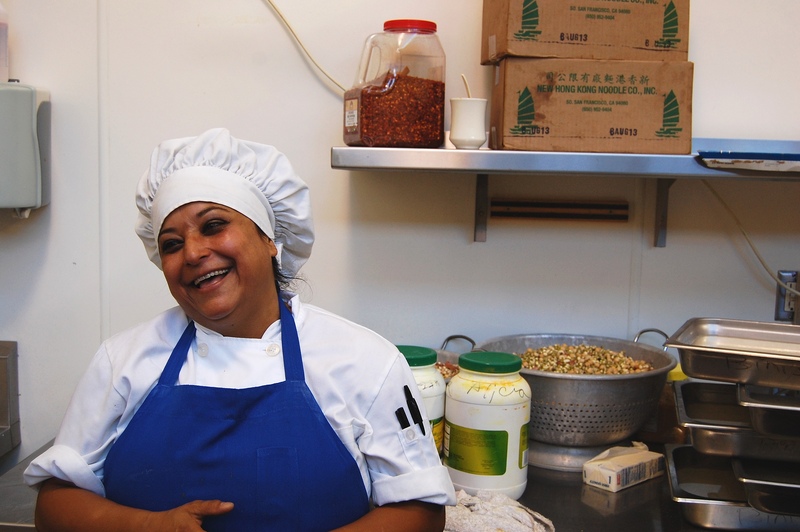 She says the secret to her momos is her spice mixture that includes spices she brings back from Nepal. Folding a momo is like making pleats for a fan. It takes a bit of practice and technique shown here by Sopa. The little hole in the top is for putting in the sauce. Cooking For Crowd Strategy: As noted above, having lots of eager volunteers is the best way to make momos for a crowd. For steaming the dumplings, if you don’t have an industrial scale steamer (!! ), Bini recommends the Asian stacked steamers in which you can steam 20 to 30 at a time. For big gatherings you will need a dedicated person to steam the dumplings in batches. Serving a Crowd Strategy: At big events, Bini spoons about 8 momos per person into little paper boat bowls. For the sauce, pour into plastic bottles with squirt tops for more fun and easier service. Bini recommends using a sturdy round dumpling wrapper. She prefers Nasoya round wrappers which come in packs of 60. For the filling, you can add spices to taste; fry a little pinch to test the flavoring before you stuff the wrapper. 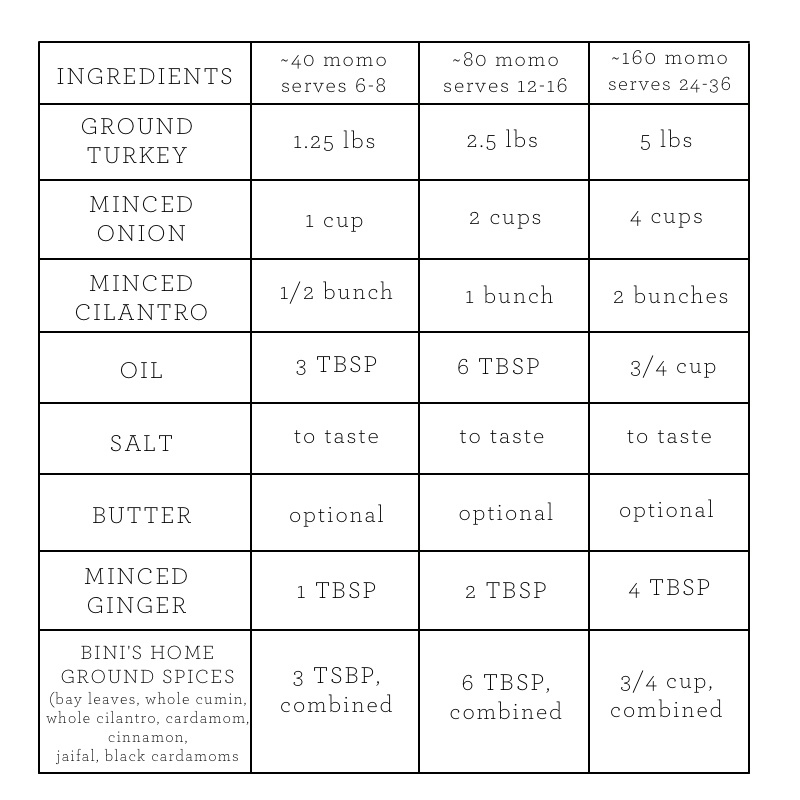 *Note that the proportion of spices is to taste. To test your filling fry up a pinch and taste it before you stuff your dumplings. Also each pack of Nagoya round wrappers includes 60 wrappers, so count on 1 pack per batch. 1. Combine the filling ingredients in a large bowl and mix gently until all the ingredients and spices are evenly disbursed. Try to handle as little as possible. 2. To fill each dumpling, place a table spoon of filling in the center of each wrapper and gather the edges together pasting with little water. Fold, wrap and pleat to make neat joint for each individual momo leaving a little “well” at the top. 3. Take a tray spray it with nonstick spray and place each wrapped momos in a row and put it in a freezer until ready to cook. 4. 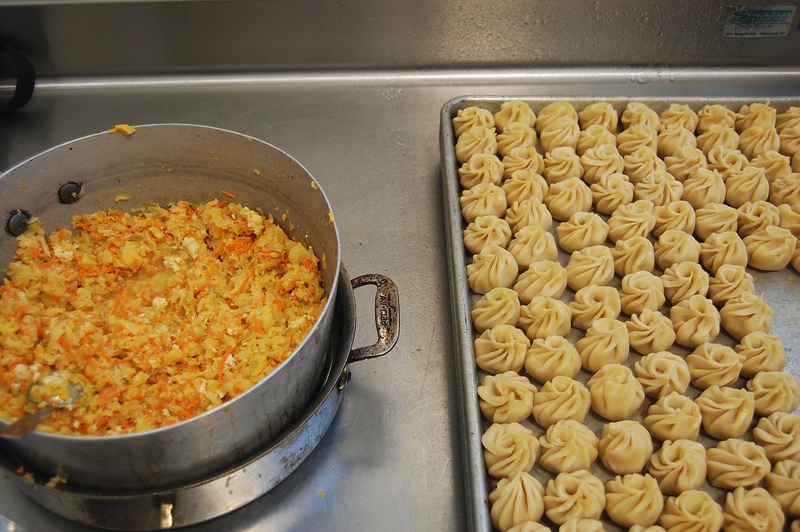 To steam the momos, fill the steamer to the half-point half with water and boil. Place a colander (steamer) on top of the vessel and grease it with nonstick spray. 5. Lightly spray each momo with oil and place on the greased colander leaving inch between each momo .Cover the steamer with lid and steam for 15 minutes. This recipe calls for a Nepalese spice called timur which is available online. If you can’t find, it just leave it out. If you are making a big batch, it is helpful to place sauce in bottles with a squirt top for easier serving. 2. In a baking sheet, roast the tomatoes for about 3-5 minutes. Set aside to let cool. 3. 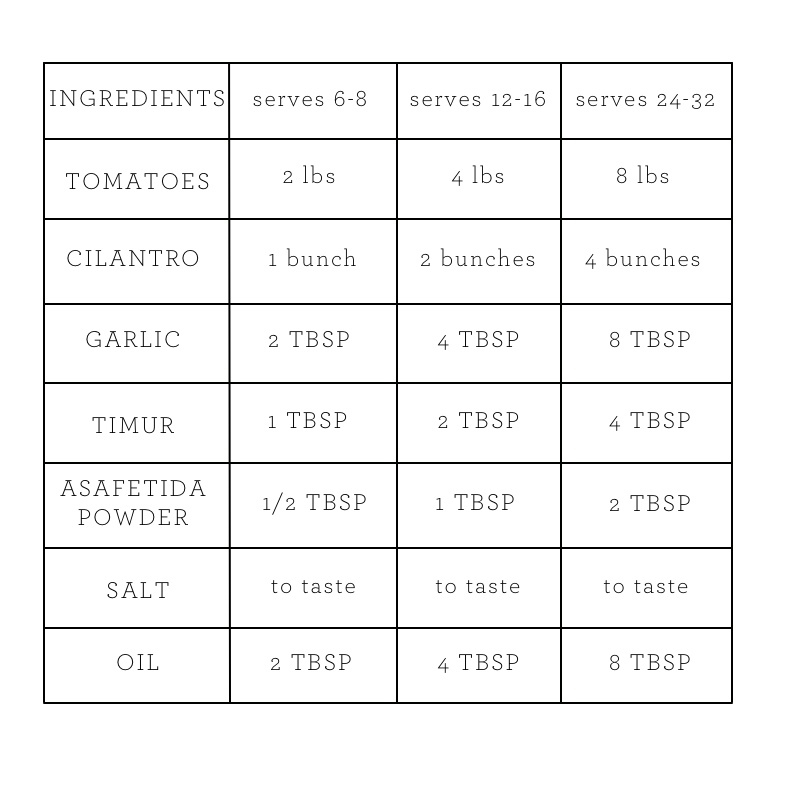 Place all of the ingredients in a blender or a food processor (roasted tomatoes, cilantro, garlic, timur, asafetida powder, salt and oil). and process until the sauce is smooth and light orange in color.